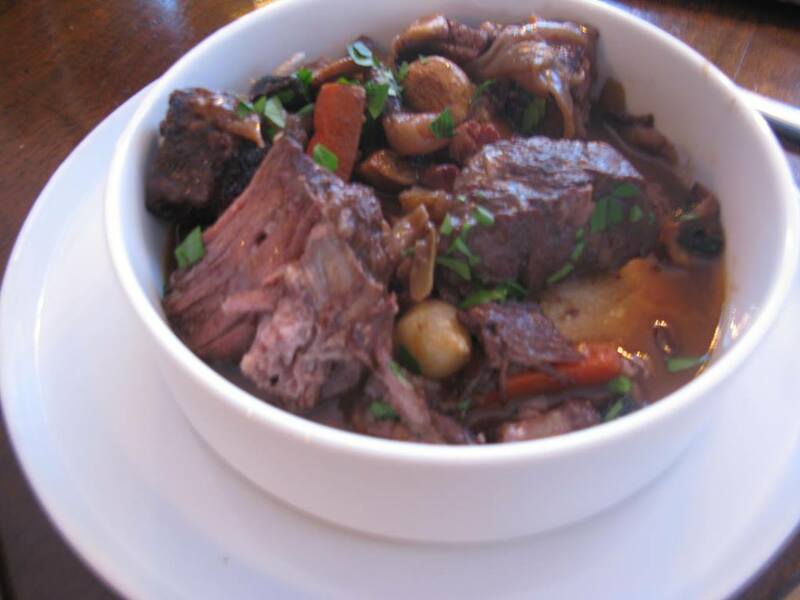 The classic French stew boeuf Bourguignon–meaning Julia Child’s boeuf Bouguignon–has become our daughter’s new favorite food. She begged me to make it this week as so I spent the better part of Sunday afternoon in the kitchen following the numerous steps required to accomplish this iconic dish. There were two specific issues I wanted to address in this our second stab at boeuf Bourguigon. First, the meat to be used in the stew. And second, how high and how long to cook it. The recipe we are using, published online as “adapted from Mastering the Art of French Cooking by Julia Child,” calls for “lean” beef, which is virtually meaningless. Any cut of beef? I don’t think so. More importantly, lean meat generally does not stand up to a long braise in the oven, which is the essence of this stew. The same recipe calls for cooking it in a covered pot “three to four hours” at 325 degrees Fahrenheit. To my mind, that’s a sure-fire way to turn beef into inedible cinders. Instead, we chose a well-marbled piece of thick chuck roast. This is the kind of cut you use for a pot roast. As instructed, we cut it into 2-inch pieces–rather large for a stew–dried them well with paper towels and browned them on all sides in extra-virgin olive oil, just like in the movie, Julie and Julia. We then prepared the vegetables, browned those, added an herb bouquet of parsley, thyme and bay leaf and covered everything with red wine and beef stock. I then cooked the stew for a full four hours, but not at 325 degrees. I set the dial of our gas oven to 225, or 100 degrees less. To my mind, that’s much closer to the correct temperature for braising meat. And you know what? After four hours this boeuf Bourgignon was cooked perfectly. The beef was not dry and tasteless like the first time we made it, but supple and oozing flavor. We drained the cooking liquid and reduced it to a loose sauce. We added quartered mushrooms and pearl onions that had been browned separately. Garnish with parsley, serve with your choice of egg noodles (unless you are off carbs, like me) and what you have is a fabulous Sunday meal. The only thing you need to add is a glass of red wine. Note to readers: If you’ve made this recipe successfully using a cut of beef other than chuck roast, please let us know what that was and we’ll try it.